Experience the innovative interface of the Touch Bar in the mid 2018 silver Apple 15.4" MacBook Pro with Touch Bar. The 15.4" Retina Display has a 2880 x 1800 resolution. It also supports the P3 color gamut, which allows for more vibrant colors. This ensures true-to-life pictures with realistically vivid details, which are essential for graphic design, color grading, and editing. With True Tone technology, the white balance automatically adjusts to match the color temperature of the light around you for a more natural viewing experience. The power button has been upgraded with a Touch ID sensor, so you can quickly log into your MacBook Pro using your fingerprint. You can also use Touch ID to make purchases over the web, thanks to Apple Pay. Touch ID enables a quick, accurate reading of your fingerprint and uses sophisticated algorithms to recognize and match it with the Secure Enclave in the Apple T2 chip. It also brings "Hey Siri" function to the Mac. The system features an 8th Gen Coffee Lake 2.9 GHz Intel Core i9 six-core processor, 32GB of 2400 MHz DDR4 onboard memory, a 1TB PCIe-based SSD, four Thunderbolt 3 (USB Type-C) ports, a Force Touch trackpad, a keyboard with a 3rd-gen butterfly mechanism, stereo speakers with double the dynamic range of its predecessor as well as improved bass, 802.11ac Wi-Fi, Bluetooth 5.0 wireless technology, and even a 3.5mm headphone jack. With True Tone technology, the display and Touch Bar deliver a more natural viewing experience for design and editing workflows, as well as everyday tasks like browsing the web and writing email. With the Apple T2 chip, the MacBook Pro delivers enhanced system security with support for secure boot and on-the-fly encrypted storage, and also brings "Hey Siri" to the Mac. The Touch Bar replaces the function keys that have long occupied the top of your keyboard with something much more versatile and capable. The multi-touch, Retina-quality display changes automatically based on what you're doing, from showing traditional system controls, such as volume and brightness, to more directly interacting with or browsing through content. Intelligent typing features like emoji and predictive text improve the typing experience, and you'll be able to customize the Touch Bar to fit your needs. The Touch Bar can also adapt to apps, such as Mail, Safari, Messages, and even third-party apps like Adobe Photoshop, so you'll have access to useful functions previously hidden in menus. A Touch ID sensor has been integrated into the power button, so you can quickly log into your account, even when another user is logged in. You can also use it with Apple Pay to securely purchase things over the web. The 15.4" Retina Display has a 2880 x 1800 resolution and features brighter LED backlighting than its predecessor as well as an increased contrast ratio, delivering deeper blacks and brighter whites. Its larger pixel aperture and variable refresh rate make it more power efficient than previous generations. It also supports the P3 color gamut, which allows for more vibrant colors. This ensures true-to-life pictures with realistically vivid details, which are essential for graphic design, color grading, and editing. The Force Touch trackpad on the 15.4" MacBook Pro takes all the capabilities of multi-touch and adds force sensors that detect subtle differences in the amount of downward pressure you apply. This lets you have a deeper connection to your content, bringing more functionality right to your fingertip. It also introduces haptic feedback to MacBook Pro, allowing you not just to see what's happening on the screen, but to feel it. With multi-touch, you can use realistic gestures like swiping or pinching to switch between apps, navigate your content, and get the most out of your desktop space. 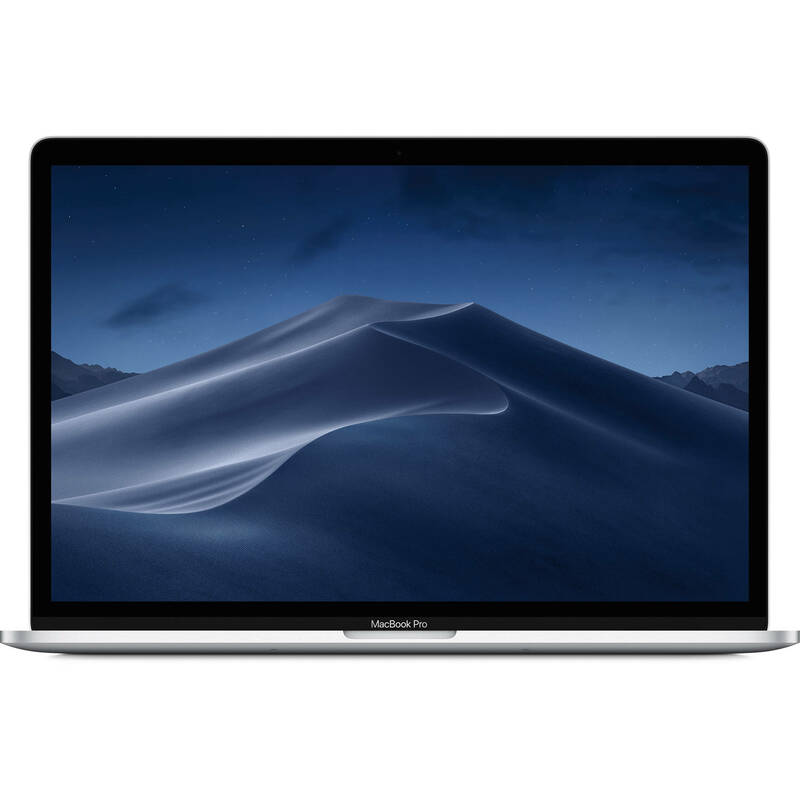 The 15.4" MacBook Pro features a redesigned enclosure design and all-metal unibody construction that creates a rigid and dense notebook that is also thin and light. At just 15.5 mm thin, the 15.4" MacBook Pro weighs just four pounds. The speakers have been totally redesigned to provide as much as twice the dynamic range and up to 58 percent more volume, with two-and-a-half-times louder bass for maximum boom. Plus, they're connected directly to system power, enabling up to three times more peak power. Thunderbolt 3 is a hardware interface that utilizes the reversible USB Type-C connector. Doubling the speed of its predecessor, Thunderbolt 3 features a maximum throughput of 40 Gb/s when used with compatible devices. The connector also transmits data via USB 3.1 at up to 10 Gb/s, and dual-bandwidth DisplayPort 1.2 allows you to connect up to two 4K displays simultaneously or one multi-panel 5K display. The Macbook Pro has four ports, with each pair using a dedicated bus. Box Dimensions (LxWxH) 17.7 x 12.6 x 3.6"